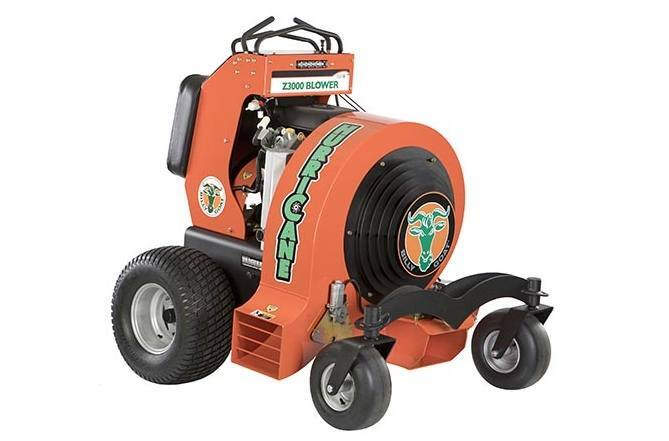 Ideal for large size maintenance contractors, landscapers, seal coaters, schools, parks departments, cemeteries, resorts, street departments, golf courses and estate properties, the Hurricane Z3000 doubles down on productivity with world class commercial cleanup power. The Hurricane Z3000's seamless operating controls, tri-directional blowing options, robust blowing power and zero-turn maneuverability bring fatigue-free operation to busy operators with large leaf and debris clean-up projects. And with 8500 CFM coupled with a blower housing design that draws air from both sides for increased air velocity, pushing leaves and debris farther for a faster finish takes the chore out of the clean-up chore. Patented Dual Deflector Air Flow System™: Allows the operator to change the angle of the air flow for deeper, more efficient cleaning of leaves and debris. Air flow can be shut down on all three discharges for transport. Patented Quad Control Handle System™: Offers seamless forward/reverse direction, automatic return to neutral, integrated operator presence control and a self-activating parking brake. Intuitive controls for ease of operation. Unique Blower Housing Design: Draws air from both sides of the housing for increased air velocity, less noise, and offers more power to push leaves and debris farther. Joy Stick Deflector Control: Allows the operator quick and easy control of air flow from left, right or forward directions, eliminating the need to blow in reverse. Simply pull-back on the lever to close flow for transport. Torsion Mounted Front Axle Assembly: Handles curbs with ease; like they're not even there. LED Lights: LED lights for night operation makes for easy clean-up when the seasonal change brings less daylight to complete jobs. Ergonomic Operator Platform & Thigh Pad: Non-skid platform and padded thigh pad offer ease of operation and operator comfort. Automatic Parking Brake: Self activates if the need to briefly step off of the machine arises. Front & Rear Tie Downs: Offer secure tie-down points for ease of transport.